Much like Jacob's Ladder, which it resembles in a number of respects, The Box is a Weird take on the 1970s. Or rather, it draws together a number of Weird threads that were already present in the 70s. Like Jacob's Ladder and much hauntological music, The Box captures a certain grain of the 70s. The Box feels like a redreaming of the Weird rather than a revival in part because of the very incoherence that some have complained about. This "incoherence" is of a particular type; it isn't simply a failure of coherence so much as the generation of an oneiric (in)consistency which doesn't add up (into a final resolution) but which doesn't fragment into nonsense either. The dream atmosphere is reinforced by the way that Kelly incorporates aspects of his own life into the film - the characters of Arthur and Norma Lewis are apparently based closely on his own parents - into the diegesis. But rather than the destranging tendencies at work in something like the new Dr Who - the Weird subordinated to familialism and emotionalism - The Box goes in the other direction, introducing the Weird into the family home - in parallel with how television used to do the same thing. The lines between what Kelly's home life and the Weird must have been soft in any case: his father worked at NASA at the time when the Viking probes were landing on Mars. The Box is based on Matheson's 1970 short story, "Button Button", later adapated into an episode of the revived Twilight Zone in 1986. To be more accurate, The Box uses both the original story and the Twilight Zone episode as elements in a simulated dreamwork which simultaneously extrapolates from the two versions and condenses them into an unstable compound. The result is a labyrinthine structure which bears some relation to Lynch's Inland Empire (Inland Empire, incidentally, was the last film to creep me out as much as The Box did). The Box is defined by the tension between the structure of the labyrinth - an absolute labyrinth, leading nowhere except deeper into itself - and the structure of the dilemma - in which reality seems to resolve into a set of disjunctions. It's possible to delimit a number of distinct but connected levels at which the film operates. The ethical The most simple level on which the film works - the film's entry level - is that of the ethical. All three versions of "Button, Button" turn on a dilemma: not so much an ethical dilemma as a dilemma about whether to set aside the ethical altogether. A well dressed stranger, Mr Steward, arrives and presents the Lewises with a box with a button on top of it. If they press the button, Steward informs them, they will receive a large sum of money (in The Box it is a million dollars); however, someone that they don't know will die. In all three versions, it the wife who decides to push the button. 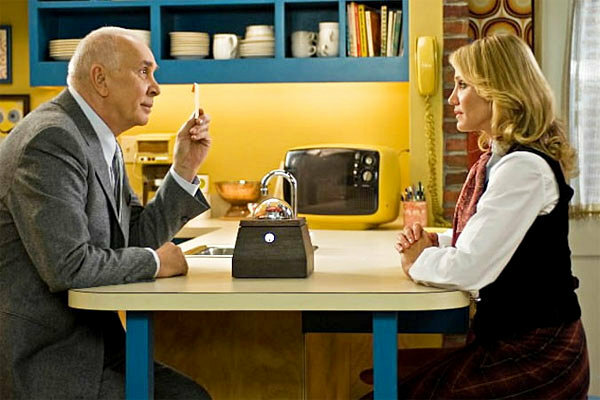 Here, the versions diverge: in Matheson's original story, after Norma pushes the button, she receives the money as insurance compensation for the death of her husband. When she complains that Steward had told her that the person who died would be someone she didn't know, Steward asks: "did you really know your husband?" In The Twilight Zone version - which Matheson reputedly hated - the ending is different. Here, when Steward has handed over the money, he pointedly says to the couple, "I can assure you it will be offered to someone whom you don't know." The Box adopts this version of the story, but this is only the beginning of the film, the first act, as it were. Unitended consequences "Button, Button" is clearly an update of W.W. Jacobs' story "The Monkey's Paw" - in which a family wishes for a sum of money, only to receive it in compensation for the death of their son. Jacobs' story was itself a play on older tales about the unintended consequences of wish fulfilment. As Wiener observed in God And Golem: A Comment On Certain Points Where Cybernetics Impinges On Religion, such unintended consequences arise because "the operation of magic is singularly literal-minded [in that] if it grants you anything at all, it grants you exactly what you ask for, not what you should have asked for or what you intend." "The magic of automatization, and in particular the kind of automatization where the devices learn," he adds, "may be expected to be similarly literal-minded". Like the cybernetic machine, the wish-fulfilling object (the monkey's paw) delivers exactly what it says it will: but what it gives you may not be what you want (or what you think you want). What Matheson's tale adds to Jacobs' story is the question of knowledge. Matheson's story brings into play the old philosophical "problem of other minds", now applied to the marital situation: even those closest to us are ultimately opaque, black boxes into which we can never see. Naturally, this also rasies the equally ancient problem of self-knowledge, but given a psychoanalytic edge. We are alien to ourselves; our real desires may be unkown to us, emerging only in parapraxes and dreams. Here the oneiric form of The Box collapses into its content - the box, like the dream according to Freud, fulfils our wishes. The inevitable psychoanalytic conjecture into which Matheson's story tempts us is the thought that perhaps the wife does get exactly what she wants - that the death of her husband was her wish all along.) In this sense the box would be like the Room in Tarkovsky's Stalker: the stalker Porcupine goes into the wish-fulfilling Room hoping for the return of his dead brother, but receives instead immense riches. In its very unreflective automatism - giving Porcupine exactly what he wants - the Room judges and condemns him. The political What Matheson's story also adds to "The Monkey's Paw", of course, is the fact that the bad consequences are not simply unintended; they were just supposed to happen to someone else. This is what makes it so much nastier than Jacobs' tale. Whereas the family in "The Monkey's Paw" are guilty only of foolishness and greed, the couple in "Button, Button" knowingly trade another's death in exchange for wealth. In The Box this is especially shocking because both Norma and Arthur Lewis seem to be "good" people - Cameron Diaz's Norma in particular is immensely sympathetic. Perhaps what allows her to press the button is the unresolved ontological status of the box itself; the thought that it might be a prank (Arthur establishes that the box is empty) allows Norma to perform a kind of fetishist disavowal ("this might not be real, so I might as well do it"). As Hauntagonist put it on his Twitter feed: "the button in The Box is a nice example of how interactivity creates anxiety & fetishistic disavowal. Diaz doesn't believe but she believes 'the subject supposed to believe' does, Arlington Steward being the stand-in for the Big Other." Here we are back in the realm of the ethical - but the ethical bleeds out into the political. The choice to press the button has a special force in the era of globalization and climate change. We know that our wealth and comfort are achieved at the price of others' suffering and exploitation, that our smallest actions contribute to ecological catastrophe, but the causal chains connecting our actions with their consequences are so complicated as to be unmappable - they lie far beyond not only our experience, and any possible experience. (Hence the inadequacy of folk politics.) What the Lewises are in effect asked to do is affirm their plugging into this causal matrix - to formally accept the world and worldliness. The significance of this is that only the negative choice counts - to not press the button would be to choose a freedom that is not available to anyone at present (we are all so intricately embedded into the global capitalist matrix that it isn't possible to simply opt out). But to press the button is to give up on freedom, to choose blind determinism. The existentialist Which brings us to the most explicit intertext that Kelly introduces into The Box: Sartre's Huis Clos. Huis Clos is everwhere in The Box; Norma, a high school teacher, is teaching it; she and Arthur attend an amateur dramatic performance of the play. At the point when it is becoming evident that the Lewises' choice will not be some private shame but will infect and destroy every aspect of their lives, the couple find the words "No Exit" written in the condensation of their car's windscreen. The resonance of Huis Clos is clear: this is a text about those who can no longer choose, who have ceased to be subjects. Fearing that they will be killed, the Lewises try to return the briefcase of money immediately, the very instant that Steward tells them that he will be sure to give the box to someone who doesn't know them. But the horror is that Norma and Arthur have made a choice that means that it is now too late: they are already (as if) dead. There is no returning the gift. It is astonishing that the briefcase containing the money is immediately desublimated. Kelly could have had the Lewises spend the money, their enjoyment shadowed by their anxieties about what they had done ... Instead, the briefcase is immediately dumped in their basement, never to be seen or - I think - mentioned again. There is no possibility of returning the money - no way of taking back the choice to press the button - but there is no end to choosing either. Locked in an endlessly ramifying labyrinth, Arthur and Norma keep encountering further dilemmas - but the choice is now between bad (purgatory) and worse (hell); or else, as when Arthur is offered a choice of three gateways, two leading to eternal damnation, one to salvation, they have a quality of grotesque gameshow randomness. The religious The mention of "salvation" is part of a persistent religious thread in the film. As the alien big Other, the one conducting "research" into the moral worth of human beings and judging them accordingly, and with the power of damnation and redemption in his hands, Steward clearly stands in for God. Yet he is a God who also performs the Satanic function of tempting humans. The Box is thick with references to conspiracy films (and includes some of the most creepily paranoid scenes since the remake of Invasion of the Body Snatchers. The full extent of the collusion of the authorities with Steward's remains unclear even at the end of the film. The threads connecting NASA, the Viking probe and Steward's research project fray off into rumour and supposition. The labyrinth never ends.